In my new report titled Real-Time Mobile Infrastructure, I ask 80 IT and business professionals involved in enterprise mobility to answer a series of questions. The results will be shared here in the following article series. You can read the introduction to this report here. Question #1: How important will having optimized mobile applications and user experiences be to the future success of your business? 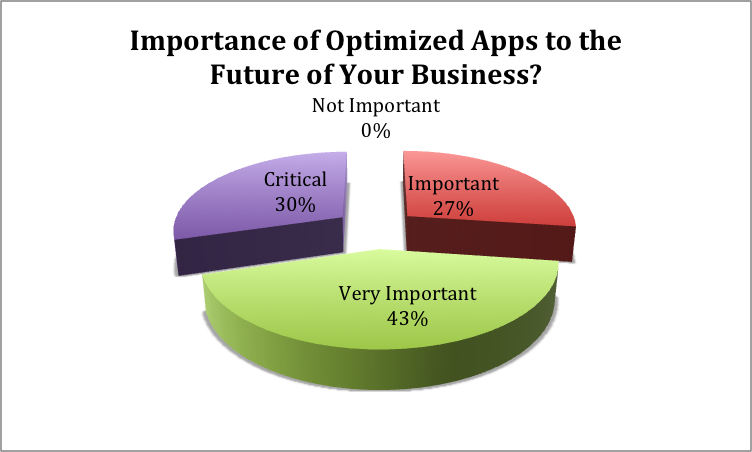 Thirty-percent answered that optimized mobile applications and user experiences are “Critical” to the future success of their business, while seventy-percent of survey participants answered “Important” to “Very Important.” These definitive responses suggest that businesses understand the key role mobile applications play today and will play in the future. What is left to be determined, however, is whether businesses fully understand how much effort and investment optimizing mobile applications and user experiences will require. The quality of the user experience, and the performances of mobile applications directly impact the user’s brand perception, and influence whether users will continue to use them. Businesses that fail to grasp the importance of optimization, will find customers are unwilling to engage with them via mobile applications and will lose out in this quickly expanding sales channel. Question #2: Is the demand for mobile apps forcing IT departments to rethink and change how they design and architect their IT infrastructure, processes and systems? The data reveals that the demand for mobile application development and support is forcing the majority (80%) of IT departments to rethink and alter the way they design and architect IT infrastructures, processes and systems. 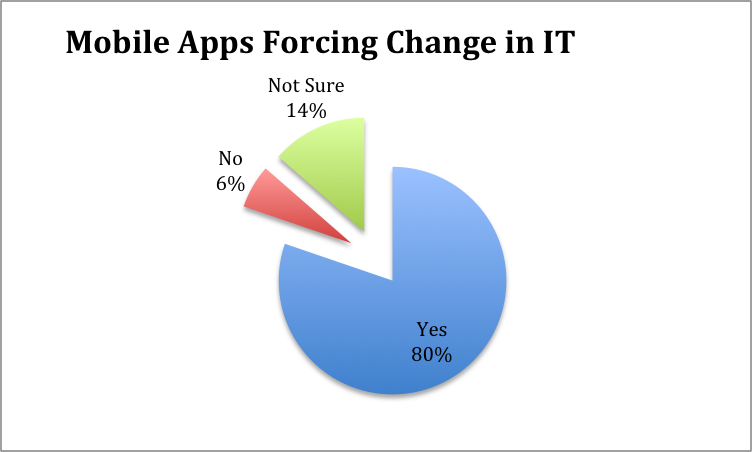 The data suggests IT environments are not optimized for mobility and this is influencing change. Companies must transform in order to support a mobile first and data driven world that is utilizing Code Halos strategies, and that thrives on the real-time hyper-personalization of mobile user experiences. Legacy and problematic systems must be updated, upgraded or replaced in order to support the real-time requirements of today’s mobile and always connected marketplaces. Read the next article in this series here - Real-Time Mobile Infrastructure Report, Part 2.